Right now I am lucky and only have one teacher to buy for. What this means is that I can go a little above what I would normally do. I have known for months that I was going to use Anna's GREAT tutorial for this gathered clutch, I heart her. I also knew that I wanted to toss in a pair of earrings from Just Enough Style her shop is closed temporarily due to holiday and new baby...CONGRATS. With the left over scraps I sewed a little bag for the earrings. I also added in a goodie...what present is complete without some kind of delicious treat?? We made monster cookies...recipe and packaging post will be on Thursday. All together a delightful little thank you for Little Man's awesome teacher. And her thank you to me...letting my kid out of school for the next 2 weeks. 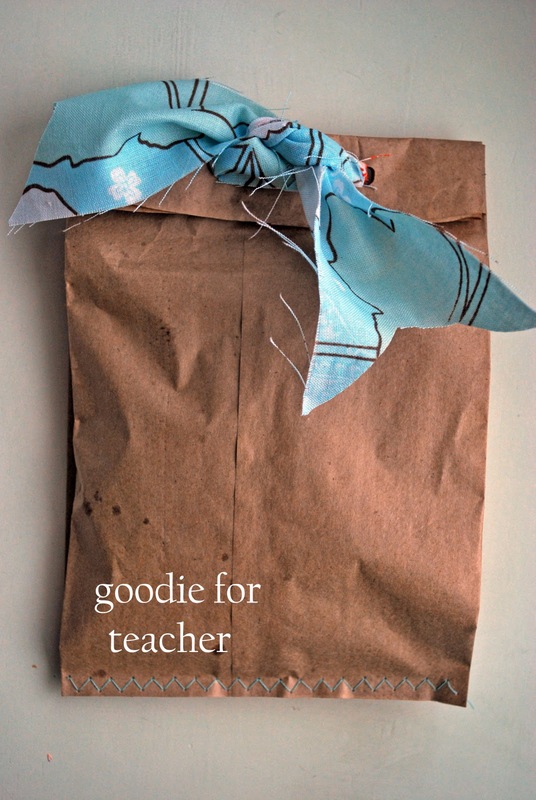 Gift heartily approved by the teacher in your family! :-) And let me say thank you on her behalf for not getting her a mug or a candle. Trust me. She thanks you. Totally adorable clutch. Love it. I think it will be the best gift she will ever get from a student. So sweet!! I totally skipped the gifts this year... but tonight at 10pm Elanor said she just HAD to give her teachers something. I don't have any goodies made... nothing. So, you'll be happy. I am making your yummy bread recipe right now. It's the best thing I could think of with short notice. I am making the cinnamon sugar filling and explaining to use it as french toast in the AM. cute! I'm sure she loved it!